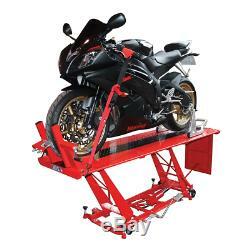 BRAND NEW BIKETEK HYDRAULIC MOTORCYCLE WORKSHOP LIFT TABLE. Designed to enable efficient and safe access of motorcycles, allowing repairs and servicing, adding accessories and extensive cleaning. Suitable for both workshops and home garages. Table size 2100 X 620mm. Side and forward locking wheel clamp. Foot operated hydraulic ram lifts 400kgs from height of 200mm up to 800mm. Wheel mounted for ease of manoeuvring, with adjustable locking feet. Removable plate for rear wheel access. Integrated tie-down hook attachment points. PLEASE NOTE THAT THE BIKE, TIE DOWN STRAPS AND PADDOCK STAND SHOWN IN PICTURE IS NOT INCLUDED. THIS LISTING IS FOR THE TABLE ONLY. THE PICTURE IS FOR ILLUSTRATION PURPOSES ONLY. This is a kerb side drop and driver is not responsible for delivering this directly to your door. This item is very heavy so it is advisable to have someone with you to assist with moving it. ALL MAJOR CREDIT / DEBIT CARDS ACCEPTED. The item "BIKETEK HYDRAULIC MOTORCYCLE WORKSHOP LIFT TABLE HEAVY DUTY CE APPROVED" is in sale since Monday, July 23, 2018. This item is in the category "Vehicle Parts & Accessories\Motorcycle Accessories\Lifts & Stands\Other Lifts & Stands". The seller is "bikerslines1" and is located in scunthorpe, Lincolnshire.